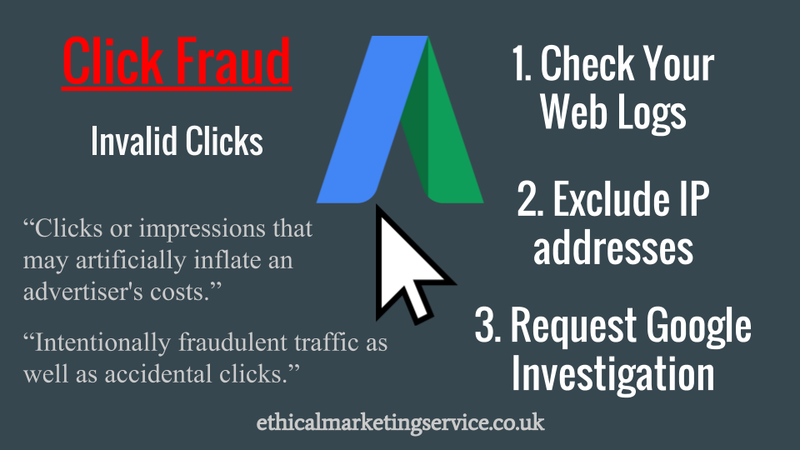 Worried About AdWords Click Fraud? This video is about AdWords click fraud or invalid activity. Our website is ethicalmarketingservice.co.uk and you can visit us if you are interested in PPC management. I always like to start off with a definition. So, according to Google, invalid click activity includes any clicks or impressions that may artificially inflate an advertiser’s costs. It’s good that they include impressions here, because I think, regularly, advertisers search for their own ad to see if it’s showing, and also whereabouts on the page it’s showing. So essentially, they are saying that they would want to filter that out. Invalid activity covers intentionally fraudulent traffic as well as accidental clicks. It includes repeated ad clicks or impressions generated by one or more users and publishers encouraging clicks on their ads. So, an example of that might be, if you create a blog post, or if one was to create a blog post, and then somewhere within the page stating that in order to support the site, that they should – the reader should click on their ads. And that would obviously be considered as invalid activity. Automated clicking tools or traffic sources, robots, or other deceptive software, I personally think that, this is likely to be the majority of invalid clicks, because it’s a lot easier to set up a bot that clicks loads of times than it is to manually go through and click everything yourself. Does it happen frequently? I have got a screenshot here of “fiverr” and their search bar, and if you search for ‘click your AdSense ad’ on fiverr, you’ll see, at least at the time of making this video anyway, that there are lots of people who are willing to go through and click on an ad for a very small fee. And if you’re an AdWords advertiser, then they will essentially be using up your budget. If you want to see quite how many clicks that you have been refunded by Google, then you can, within the user interface of Google, you can enable the column ‘invalid clicks’ at campaign level and select the time period that you’d like to see how many clicks you’ve been refunded or reimbursed. And you will see how many times that’s happened. If you don’t know how to do that, there’s a video that we’ve posted on our channel. All you have to do is search for “add or remove columns” and it should come up, and it’ll essentially show you how. If you want to use a service provider that claims to eradicate click fraud, and there’s plenty out there that do it for a monthly fee, my personal opinion is, on the one hand, it’s possible that you might be at a loss, with respect to Ad spend. If you don’t have this, but if you do decide to use a company, then you are definitely at a loss. And what could they have in their software that Google doesn’t? There’s a claim or a response here from one of the providers is that they proactively do it. They prevent it from happening in the first place, whereas Google will refund you if it happens to you. So, it’s possible to run out of AdSpend. Personally I think that, you know, you have to have a significantly large budget to justify the monthly fee, in order for it to be a worthwhile fee. Before I decided to create this video, I spoke to Google, or at least I spoke to an individual who works for Google and they stated that in a manual review, Google examines over one hundred data points to see if you have been the victim of click fraud. One of the questions that I’ve had is regarding mobile devices and the fact that, they connect to various different Wi-fis and therefore, that it would be a different IP address if you went from one to the next and clicked again. But this is one of the things that Google investigates. So it wouldn’t get past them. You can be charged twice legitimately in a period of thirty minutes. I personally think that the thirty minute thing was a bit made up, because they’re essentially quite unwilling to, release data on how many clicks and over what time periods. Because, if you knew exactly what the algorithm was looking for, then you could just set your bot up to work around that number. So, they’re a bit reluctant to state exactly what it is, but they’re essentially quite clear on the fact that it’s very easy for them to see whether it is the case, that you’re a victim or not. Their approach is two-fold, it’s proactive, and we’ve got one reactive, which in their investigation they’ve stated that Google builds in a high false positive rate by marking a much larger number of clicks as invalid than are believed to be generated with bad intent. So, if you had, say 5% of your clicks which were invalid, they might filter in a margin of safety, which say, for example, bump it up to 7%, just to make sure that you’re not, even though they believe that they are accurate, they might just make sure that you’re not a victim of click fraud. Google states that you’re never charged from their staff or their bots. So, anything, any bot that is a Google bot, you wouldn’t be charged for that, or any staff that’s trying to get in touch or whatever. So the first approach is their filters. Automated algorithms which filter out invalid clicks in real time, before they are charged to advertisers’ accounts. They analyze all clicks on AdWords ads, so all the data is used within Google AdWords, to make sure that it’s accurate. 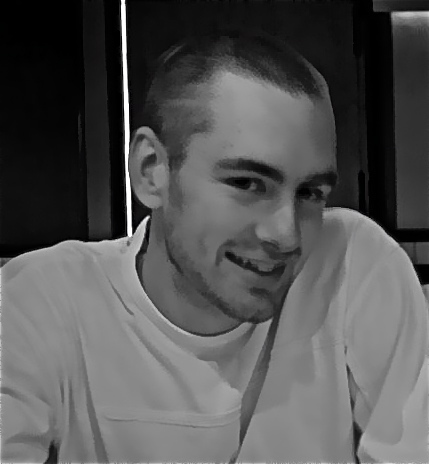 Automatically discard clicks and impressions from known sources of invalid activity. So, if there is a particular company that specializes in, click fraud, then they’ll automatically discard that. Account for vast majority of invalid click detection. So, essentially they’re saying most of the issues are solved at step 1. They also do offline analysis, so, this would be a manual review that I referred to. Automated algorithms and manual analysis, so, just repeating what they said in step 1. Focuses on the AdSense network, but also includes Google sites and those in other networks and accounts for a much smaller proportion of invalid clicks that that detected by our automated filters. So it’s just another way of saying that, most of it is solved at step 1. If you don’t believe that these, issues have been solved, you can request a manual investigation. They claim that is relatively rare and that all advertiser enquires about invalid clicks are investigated by Google and taken very seriously. I personally think that they push back a little bit here, because, essentially they get lots of people that are suspicious of it and, you know, they have to push back due to the volume of requests. So, I’m not sure that I agree with that one hundred percent. The number of invalid clicks detected by investigations is negligible relative to the number detected by filters and offline analysis. So, again they’re just saying once we do an investigation, it tends to be that step 1 and 2 have already covered it. So, is it perfect? Not even close, in my opinion. And there are many instances that software just can’t detect are not legitimate. So, an example of that might be, if I try and explain to someone what it is that I do and get them to search for local service and they click an ad without, you know, quickly, without listening, and essentially there’s no way for a piece of software to know that that click is invalid. And that’s actually something that I have experienced. Why would a manual review be needed if Google can stop all click fraud? I personally think that it’s nice that they have the request to do it, but, you know, if it was a hundred percent bulletproof, then, it wouldn’t be needed at all. What you can do if you, want to prevent it from happening, and also, again, if you want to have a manual investigation. You can exclude IP addresses within AdWords, which again, we’ve got a YouTube video on our channel, which shows you exactly how to do this. It’s often used for staff members; if you’ve got staff, you don’t realize that you pay every time the ad is clicked, or can’t differentiate between the natural and the paid results, then you get their IP address and you can exclude it. You can monitor your web logs, so, essentially, you can just view all the visitors that are coming to your website. And if you think that one is regularly clicking and you, essentially, don’t want the ads to come up to that particular user, then you can exclude them from the ad. Make sure that the ad doesn’t show to them. And then, lastly, if you feel like you’ve been a victim and you want to, make sure that you have an investigation by Google, go to that link which will be in the description of this video, and you can request an investigation. So, in conclusion, personally, my feeling is – it is very easy to claim click fraud if the account’s not working, but it is much more difficult to improve your marketing and your website. So, little quote “be willing to do what others won’t and you will get what others can’t”. So, you know, look at your account and work hard on improving it. Get an expert to look at it, if that’s something you can afford and also make sure your website is as persuasive as it can be to a user and make sure it’s in their interest and all the principles that go to making a website as profitable as it can be for the company. This entry was posted in adwords and tagged adwords click fraud, adwords invalid activity. Bookmark the permalink.